"On January 14, 2009, Nortel Networks initiated financial restructuring under the Companies' Creditors Arrangement Act (CCAA) in Canada. Since then most of the company's assets have been sold off, no severances or retirement allowances have been paid, all medical benefits and life insurance have ceased and the province of Ontario has taken over the Nortel pension fund. 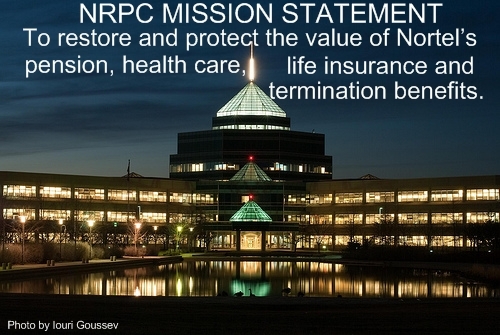 The NRPC's major priorities are to ensure that Nortel retirees and former employees receive the maximum possible compensation for the benefits they have lost and to provide pensioners more favourable financial options when Ontario winds up the pension fund. We will do this through representation at the CCAA process and by seeking urgent action from governments to protect our rights as citizens and as Nortel creditors and by communicating our story to political leaders and the public nationwide." NRPC Membership Renewals are NOT Required - Existing members of the NRPC have had their current memberships extended for free. New memberships and renewals of old memberships are now closed.